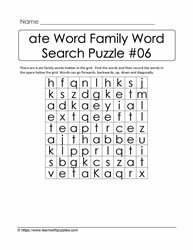 Are you leveraging the power of puzzles to support students' vocabulary building skills? 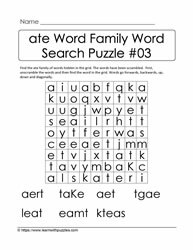 Use this 4-set collection of ate family and rhyming words to engage student's brains while supporting vocabulary building, visual acuity and fine motor skill development. 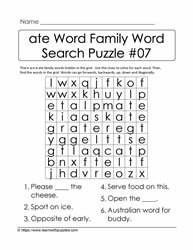 A unique list of ate family words has been randomized for the different sets of puzzles. 3. 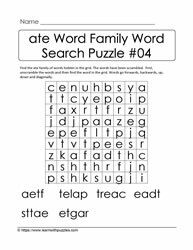 Word search puzzles where the list of ate family words have been removed from the word bank. 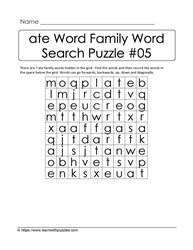 Students use their current base of knowledge of ate family words to locate words hidden in the grid. Then, they record the list of words in the space provided under the grid. 4. 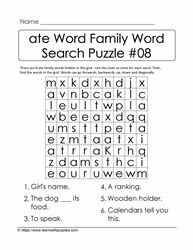 Word search puzzles that use clues for students to solve. 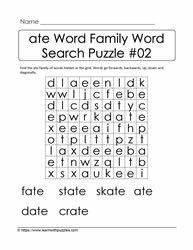 Next, they find the words hidden in the grid. 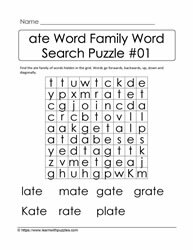 These brain teasers are suitable for homeschooling environments, early elementary and primary classrooms and classrooms supporting English language learners.